and the Okie-Tex in eastern Oklahoma. Believe it or not, thousands of dollars of hardware laying around all week and no problems with theft. The WSP has limits on the size of the RV they can accommodate do to small area it is in. I have a few other hobbies but this is my real first love. That looks like some serious equipment. Anytime I see a link to Hubble or similar pictures I always click and am always awed by those pics. But have never got into going out to see it first hand except the rare occasion when I am in a dark enough area to see the Milky Way well with the naked eye. Even that is getting harder to do. Looks like a fun hobby. I’ve help a friend build a few telescopes. He would find the lenses come up with a design and I would do the machine work. You always have friends if you have a machine shop. Just joking I enjoyed helping him. When he was in grade school he made a lense for a science contest and was disqualified. They said he had to have help but he didn’t. There was no one to help him. He didn’t have a father, lived with has grandparents and they couldn’t help. When I’m in Wyoming on Union Pass at 9300 feels I always enjoy the night sky. 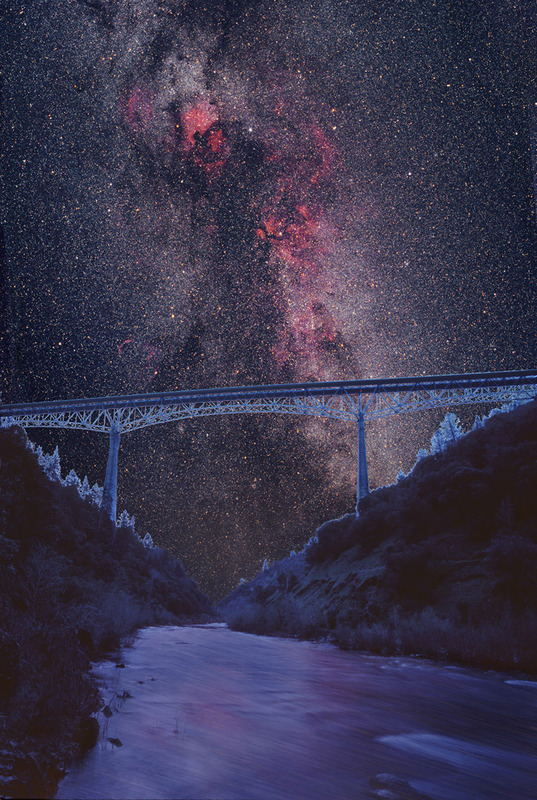 The Milky Way looks like it was painted on the sky. Beautiful!! I enjoy long range groundhog hunting, 1000 yards. Around here the coyotes have about ate them all. Anyone interested in the equipment and a look at it Google, Groundhog hunting with Lynwood Harrell in Virginia. The guy that wrote this up tells of 700 to 850 yard shots. I've built scopes from 4 to 24 inches. Not the glass but the structure to hold the glass. I have a few mirrors made by others (4"f/11, 2 8"f/7, 10"f/5.6, 13"f/4.5 and a 24"f/5.6). 1000 yards!! I do good to get a Yote at 200 with the Savage .223. I like shooting and hunting also. We boat on Lake Conroe and Travis and the inter-coastal near Navarre and Destin, Florida. My neighbor in Idaho had a building where he had a telescope. He loved to look at the stars. His telescope was huge. Had to stand on a box to look into the eyepiece. He had lots of books on stars and astronomy. RIP Tony and Daphne. Other hobbies - way too many but am starting to limit them, and according to my 'suffering' DW, about time. IT'S A FORD Love it. Most guys put Chevy motors in hot rods. I think that's disgraceful to put Chevy motors in Ford cars. Your hot rod looks bad azz. Dave very nice. I have always wonted an old Corvette, 58 or early 60s but if I had one I wouldn’t drive it so what is the use. Unless you are doing something like Dave is doing cars aren’t fun anymore. Remember when you washed and waxed your car Sunday afternoon. Points and plugs had to be changed about every 10,000 miles, brakes had to be changed then there was generators and starters and oil to be changed every 2 or 3 thousand miles. All of this repair kept everyone interested in care. When you pulled up beside a 57 Chevy did it have a 283 or a 350 and did it have 2, 4s or a 396, 360 horse or a 427 with 425 HP. Or could it be like my brothers with a built 427 with who knows how much power. All these new cars are the same. Try putting a 427 on a new Chevy. New cars last forever. You change the oil every 10,000 miles and never need to check it. They almost never break and when they do you don’t even know where to start to fix them. They aren’t any fun anymore! "Other Hobbies," airplanes and power/sail boats.